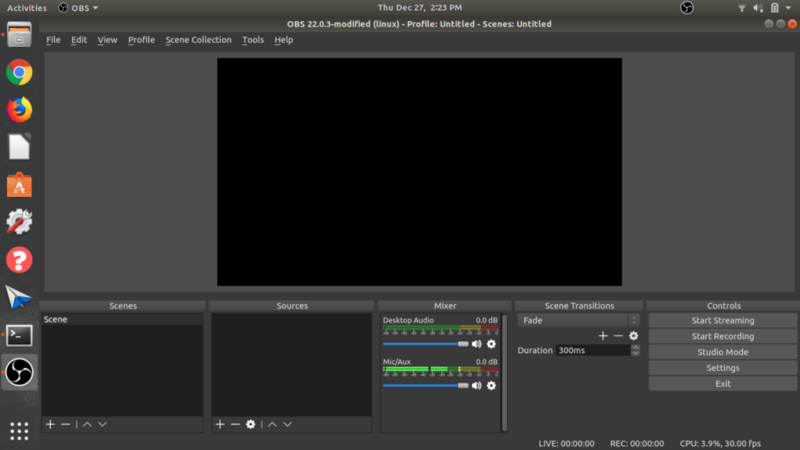 Open Broadcaster Software or “OBS” is an open source tool for streaming videos and shows live. This tutorial will walk you through the setup of OBS on Ubuntu, tailored for the student 1:1 laptops at Penn Manor School District. Penn Manor Employees should use the Tech Knowledgebase article. To get started, we first need to tell Ubuntu where to look to get the latest version of OBS Studio. Open a terminal by pressing ‘Ctrl + Alt + T’. In the window that appears, type the following command (or copy and paste it) and press Enter. That’s it! When the command finishes, OBS-Studio will be installed. To run OBS, click the Super key (windows key) and type OBS. You should see the black OBS logo. When the “Auto Configuration Wizard” opens, you can press No to continue following this tutorial for your setup. OBS will tell you where you can find the wizard again if you change your mind. 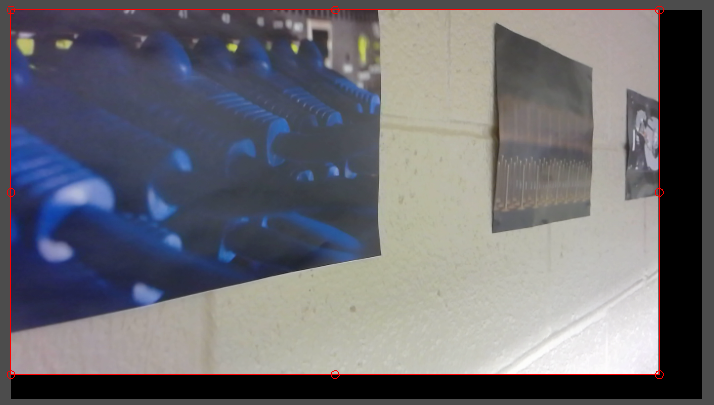 At Penn Manor elementary schools, you may find a USB microphone and a USB camera or webcam that you can use with your OBS studio to get better video and sound. Let’s look at how these devices can work inside OBS. First, be sure to plug in all the devices you plan to use BEFORE you open OBS. OBS will look for devices when it opens and might become very unhappy if those devices disappear, or if new devices appear after it has been opened. At this point, you will see the following screen. There are five sections at the bottom: Scenes, Sources, Mixer, Scene Transitions, and Controls. For this brief introduction, we will focus just on the Sources and the Mixer. Both the Sources and the Mixer sections will be used to work with audio devices, so you should be familiar with both of them. Every “Source” in OBS has “Properties” and “Filters” available to it. Properties – are the settings and details about the source, like which camera or microphone to use, where in the computer an image is located, and other related settings. 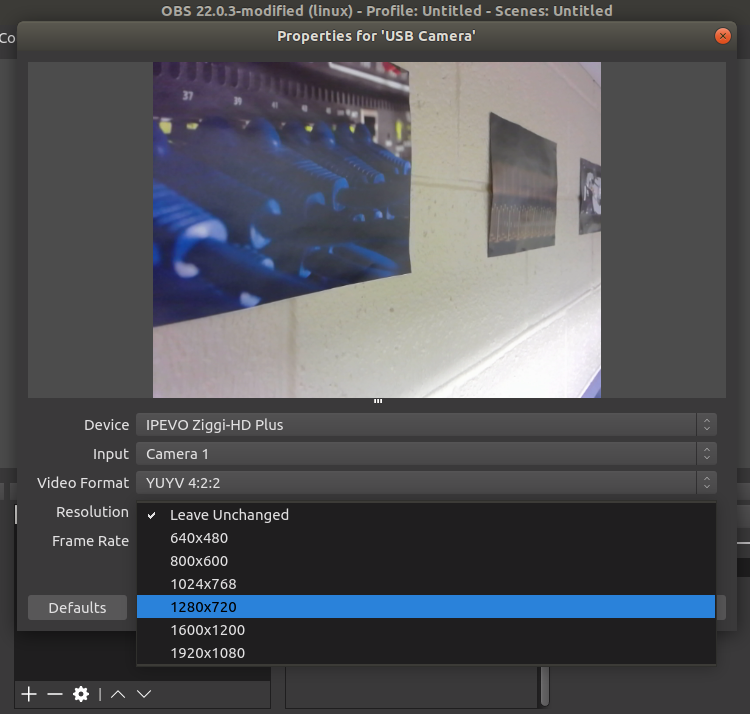 Filters – are effects that OBS can use to modify the source. Right click any source to see it’s properties, filters, or other media-specific options. The Mixer shows all your active audio devices. 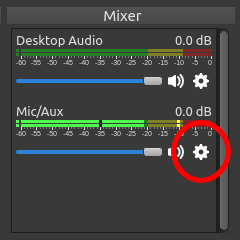 This can sometimes be confusing because you might add certain audio sources to your scenes and have the same device show up in your mixer twice. Just remember that what ever is in your Mixer is the audio that is currently active on your live scene. You can always turn the volume down on an audio source to mute it. In this case we already have a “Mic/Aux” audio source. By default, this is using the built-in microphone. To change this to use the USB microphone, click the little gear right under the Mic/Aux line in the mixer, then click Properties. In the properties window, you’ll notice that the “Device” is set to “Default”. We don’t know which device the computer is using as the default, but it is probably using the built-in microphone. Click the dropdown and find the USB option. Mine says: “USB PnP Audio Device Analog Mono”. You should now notice the volume meter for our Mic/Aux audio device react when you tap on the microphone. Now, on to the video! In the bottom left of the Sources section, you’ll find a little plus button. Click it, and you’ll be presented with a long list of possible sources. Don’t let it scare you! 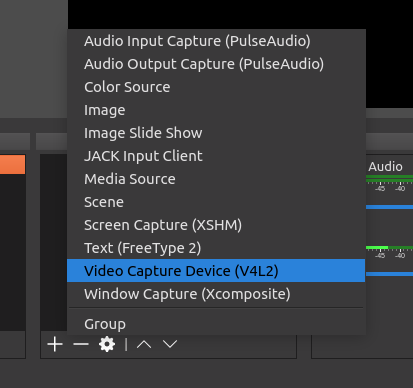 OBS can do a lot with all these options, but for now, we just want to add a “Video Capture Device”. We’ll need to give it a name, so let’s call this one “USB Camera” just so we don’t get confused later. On the next screen, select the device drop down and find your camera. You might also want to select the resolution and frame rate. By default these are set low, so it’s a good idea to go for at least 1280×720, but be aware, the higher you set the resolution, the lower your maximum frame rate will be. What are ‘resolution’ and ‘frame rate’ you ask? Resolution – is how clear the picture is. Specifically it’s how many pixels or dots are used to draw the image. The higher the number, the clearer the image, but this also makes the computer work harder. Frame Rate – is how smooth the video is, especially when there is movement. Specifically, it’s the number of frames or images that will be drawn every second. The higher the number, the smoother the video. After clicking OK, we have our camera in the studio window. Notice the red border around the edge of our video. At each corner and edge, you’ll see a little red circle. Click and drag that red circle to match the size of your canvas. We could just press “Start Recording” and OBS would happily record a video right now! However, the default settings might not be what you want. In the Controls section in the bottom right, click the “Settings” button. On the left, you’ll see all the categories of settings for OBS. Click the Output icon to see where OBS is planning to save your recordings. For me it’s under /home/user/snap/obs-studio/231. That’s not ideal. Click Browse to choose a better place to save your recordings (use the up button in the Browse window to get back to the /home/user directory). Another useful setting while we’re here is the canvas size. Click on the Video icon and you’ll see two resolution options. Personally I like to set this to 1280×720 for both the input and the output resolutions. At this point, you have everything set up to record a video. Continue to explore the interface and you’ll find things like the Chroma key filter for green screens, and a host of other features to make your videos awesome. This year at CPOSC I gave a lightning talk on how to learn faster using mind tricks. Here are the slides. Fun Fact Friday for 2018-2019 is slowly in the works. Over the summer, there were a lot of updates to software systems at Penn Manor. This year, the TVs at Central Manor needed an update before they could run, which meant we couldn’t start Fun Fact Friday right away. This year, I expect more of the content to come from students. Last year we had several 6th grade students help set up for Fun Fact Friday, and this year we will be doing something similar, with an emphasis on opportunities for students to participate throughout the school. Visit the Fun Fact Friday page to learn more. Fun Fact Friday was a big hit last year at Central Manor Elementary School. It’s a project where students can create slideshows about various educational topics that are displayed in an interactive space for the entire school to see. Students last year put loads of energy into creating some amazing slides about everything from firefighting to jungle plants. But why stop there? Why not give students the chance to run the project? This year, with my oversight, these five students will be setting up the screens on Friday mornings to display the slideshows created by other students around the building. There was a question twirling in my mind when I started the program back in September of 2016: ‘how can I make this project self-sustaining so that it can have a long lasting impact on the building as a whole?’ The less interaction I have in the project, the better the chance it will have of standing the test of time. With that in mind, I’ve been trying to think of ways to take myself out of the process and make it even easier to set up. Currently, each Friday morning I start up the 5 computers and screens and connect to them from my desk where I can control them (like a good IT guy often does with computers). This makes it a very quick process for me, but it doesn’t make it easy for teachers, or other volunteers to do. They would have to go from screen to screen and repeat the same steps, and that would take up too much time. Today, I talked to the 6th grade teachers at Central Manor about my idea to give some of this responsibility to some students. They loved the idea and each selected a student or two that they thought would be a perfect fit. I promptly showed them how to turn on the screens, open the slides, and set them to loop in full screen. In the weeks to come, I’ll be gradually granting more ownership to these five students as new topics arise. They’ll get to choose what information is displayed on each screen and sometimes make changes to animation and slide order. Eventually, we might have a classroom make slide for Fun Fact Friday by creating one slide per student in the class. Then, these students might be able to collect those slides and group them in a presentable order for the five screens. The most exciting part of the new structure is that students get the chance to be responsible for the “infrastructure” that brings creative work to life for the entire school to see. These are life skills in action, inspiring young people to do exciting things. 1:1 May be the best thing that ever happened to an Elementary School classroom. 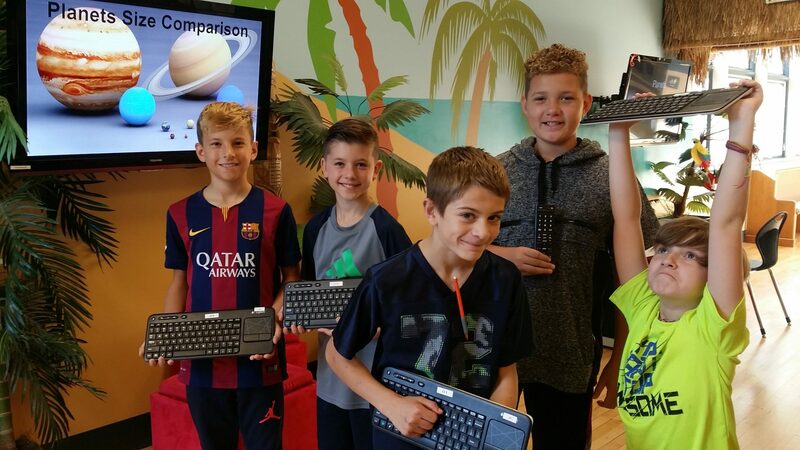 A few weeks ago, several 5th and 6th grade classrooms around Penn Manor began a pilot program giving each student their own laptop to use for class. As of now, these laptops stay in the classroom, but the students have the same level of access and control as the 1:1 students at the Middle and High Schools. Until I saw this for myself, even I wasn’t fully convinced that an effort of this scale at this grade level would be as big a win for both teachers and students as it is at the higher grade levels. Of course it would be easier to manage the laptops this way than with laptop carts that are shared across an entire building, but what would education look like? How could a small change like this, from using a shared laptop to using your own laptop, make much difference in the larger scheme of things? Today at Eshleman Elementary School, it all clicked for me as I watched students lead the way in learning for the future. Here’s what I noticed. Learning happens at a much more rapid pace when you own your education. If you decide you want to know as much as you can about hot air balloons for example, and you “own” the study of hot air balloons, you will find yourself truly enjoying your study time and you will learn much quicker because you have a greater desire to learn. This 1:1 program does something very similar for the student. A simple thing like being able to change your wallpaper and know that no one else will set it back gives each student the feeling that they are in full control of this device and they can personalize it to their liking. That personal touch is freeing, and soon, they are exploring the world with more interest and excitement than they ever had before. In the photo above, the teacher (Mr. Bodde) has divided students in to small groups that can each be working on things that are more targeted to their current learning needs. The teacher can visit one station at a time, and give more direct and personal attention to each student, while not taking away from his view and value in the classroom. This has become a popular way to enhance the classroom learning experience, but when any student in the room can pull out a laptop at any time, the stations method quickly becomes an even more powerful way to teach. Teamwork can be a challenge at the 5th and 6th grade levels. In a 1:1 setting, collaboration becomes much easier. Imagine students collaborating on a group project where each one has their own laptop, but they are all working on the same document. One of the projects that Mr. Bodde is working on is a classroom blogging system that’s only visible to the other students in the classroom. In this system, every student has their own blog, and they can post things to it that anyone else in the class can see. This is a project I’ll be keeping my eye on. This is just the beginning. There is so much more potential in the weeks and months to come, which will be expanded by some of my own efforts like Tech Club, Tech October, and other opportunities that I find to inspire learning. 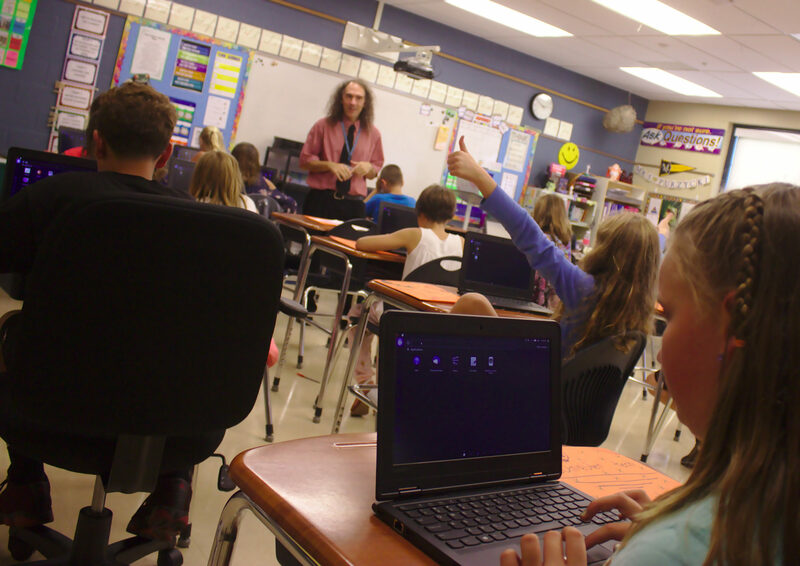 Yesterday we rolled out a pilot of one laptop per student in a few classrooms around Penn Manor. 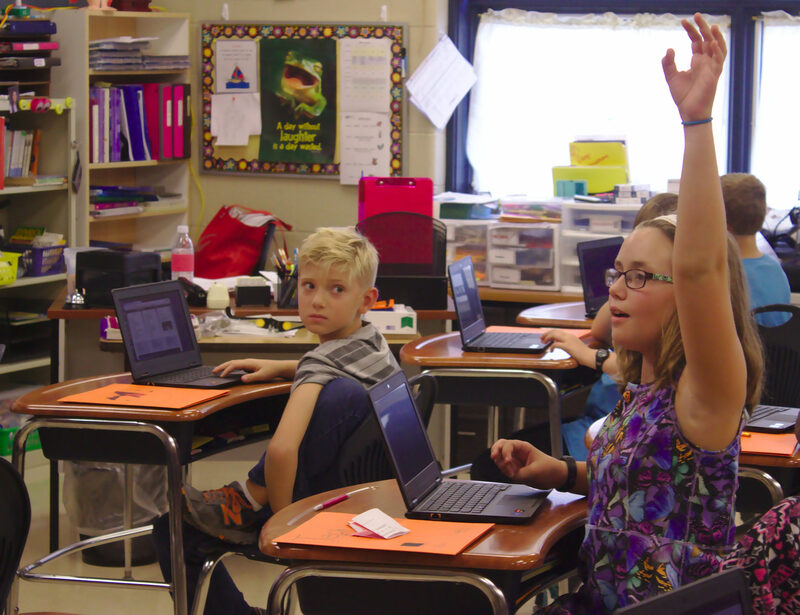 The excitement and opportunity for each student could be felt across the room as 5th and 6th graders were assigned a single laptop that would be theirs for an entire school year. This level of ownership will make it easier for students to work on class projects, do research, and create presentations, videos, artwork, essays, and more. So, how did it go? As always with something new, there were some lessons learned, but for most classrooms, the roll-out was relatively seamless. Some students even started making things in their Google Drive right away. The opportunities are endless in a program like this, and the coming months will certainly be worth watching. The start of the 2017-2018 school year presents new and interesting challenges for Penn Manor. 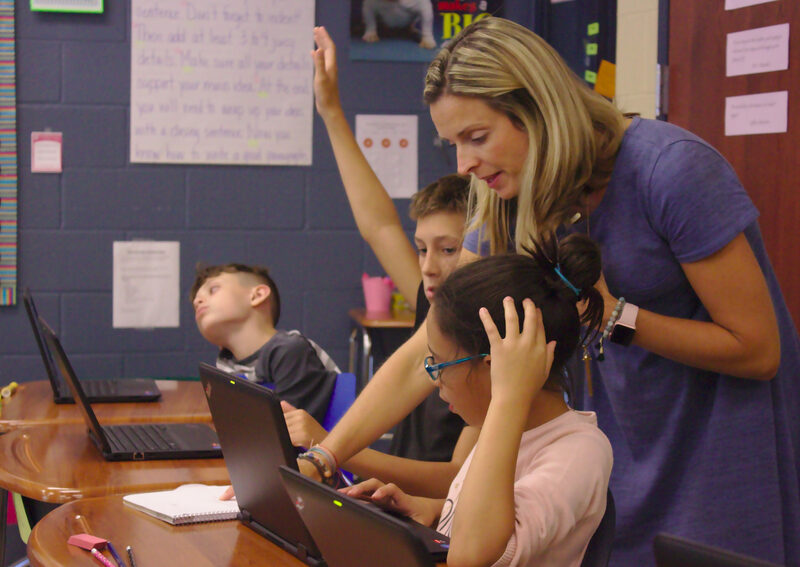 There were many changes in the IT department over the summer, and the reopening of Conestoga Elementary School presents it’s own challenges. All these changes and at the same time, we’re look for a Technology Specialist to fill an open position in our ranks. It has been an exciting ride, but we did it, and there is even more to come! The opportunity to promote the proper integration of technology into one’s life is a great honor and privilege, and I’m thrilled to be a part of the Penn Manor IT team! Starting this morning, Penn Manor has switched to Google for email. 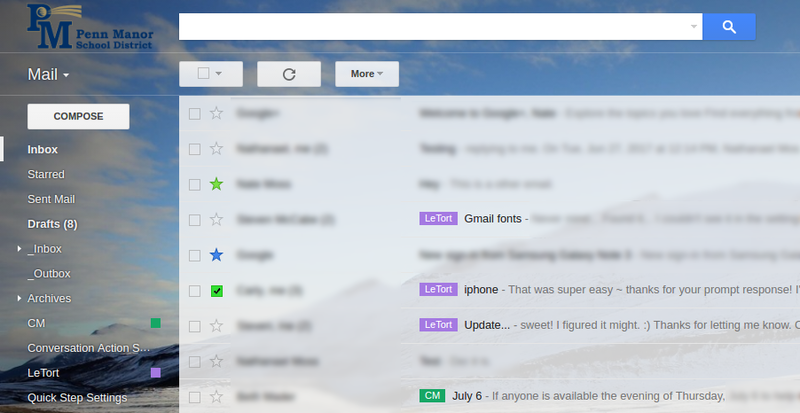 Gmail provides some very useful features for making email easier to use and keep up with. This coming school year, I’ll be sharing tips on these features, like how to use labels, filters, stars and more! In January, I began a journey of exploration. There was a need to educate students on the proper care that should be given to student laptops. It made sense to try an experiment, and give students an opportunity to get more involved in technology. The idea culminated in what came to be affectionately called, “Tech Club”. Tech Club was divided into 3 cycles between the months of January and May, each lasting about a month and a half. The first cycle was very foundational. Being the very first, there were certainly some things that could have been done better, but I made up for it by doing whatever fun things I could think of, like an introduction to Scratch where they could make their own game, or taking a laptop apart. Lessons learned from the first cycle inspired the content for cycle 2. This time around we began with the Spheros, a toy designed to introduce kids to programming, and certainly a lot of fun. We then began to look at how computers work, and had a competition to rebuild laptops. I collected a set of laptops that were being retired so we could destroy them without consequence. The children went to work with screw drivers in hand and learned how to fully disassemble a laptop and put it back together in working order! The third cycle was all about media; video, audio, photography, editing and so forth. I felt it was important this year to see what children can create in this sort of program, to push more into the creative side for future programs of this kind. 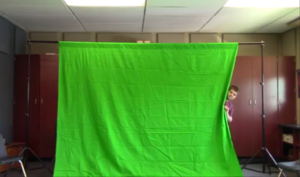 I pulled out my green screen and we took some video with that as well. I always put the kids at the controls and give them the opportunity to own their project. Central Manor is making a video about bullying, and LeTort is making one about playground safety. All in all, Tech Club has been a very successful endeavor, requiring little prep time and offering a lot of value. There were ups, and there were downs, but many many lessons were learned. Wheels are turning already to create some similar efforts next year, hopefully efforts that will be even more effective at inspiring the next generation to be creators, engineers, and inventors. Today is the first day of our last of three cycles of Tech Club at LeTort and Central Manor elementary schools this year. So far, this experiment has proved wonderfully successful, and I truly believe it has laid the groundwork for similar programs in the future. This past cycle, two of my 5th grade students wrote about their experiences. Here they are, word for word. I am Suren. A tech club member at Letort for the second rotation. 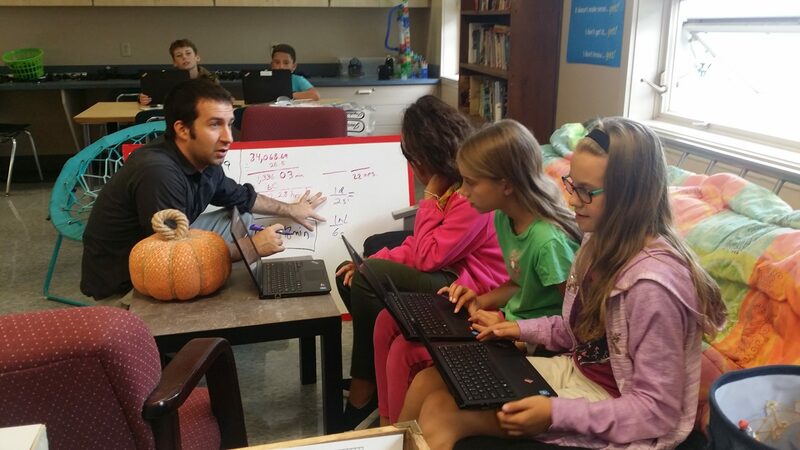 Us tech club students at Letort were asked by Mr. Moss to write a paragraph for his blog. So, he is what I have to say. 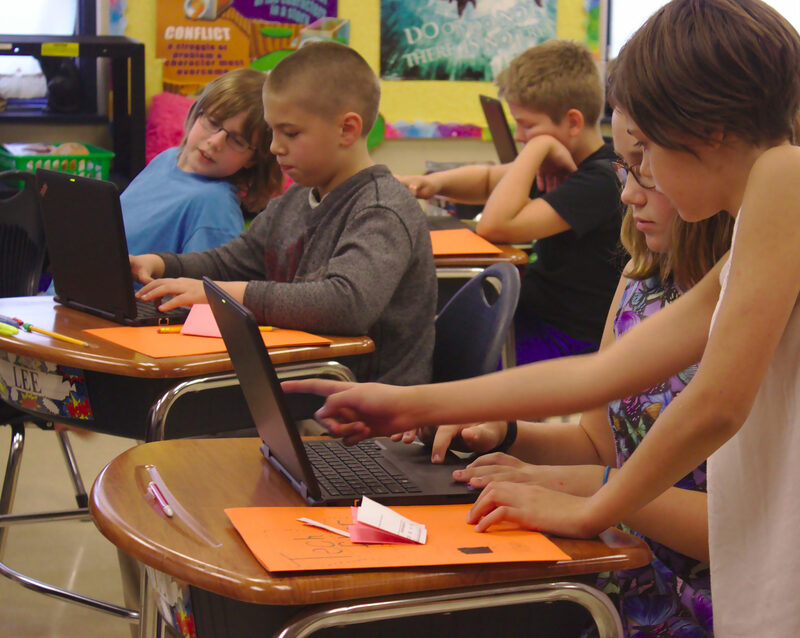 Tech club : A place where kids at some of the Penn Manor Elementary schools learn about tech. I had tried out for the first rotation of tech club, but I did not get in. This rotation I put my very best into the try-out and guess what? I got in! The first week or so of tech club we played with a little sphere robot called cphereo. It was so fun to play, explore, and code with cphereo. After that unit was over, we started to get into parts of a computer. First, we learned about all the parts of a computer. Then came a challenge. All of us tech club students went head-to-head in a race to take apart then rebuild a computer. Cole won and I came in second place. After that day we did a competition called ‘Research race’. In that we are given things to look up, and the first person to find that thing gets a point. I won that race and Cole came in second. From there on, well I don’t know because I am typing this on the day of ‘Research race’. So, have a great tech day. I hope you enjoyed reading this article. Bye! My name is Sydney and I am a member of Tech Club. In Tech Club, we do many fun and exciting things! 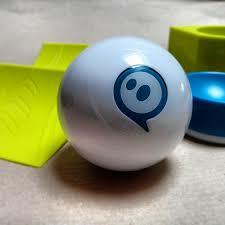 Like currently, we are working with Sphero robots along with rebuilding laptops. We do many games like research races and draw the computer parts. Every day is exciting and I can’t wait for every Tuesday and Thursday when we have it. Now granted, Mr. Moss thinks that we are a mischievous bunch. We have lunch with him and talk about the different computer parts. Mr. Moss is pretty patient and has a great sense of humor basing off of the fact the we may not always behave the greatest. Today, we raced to see who could take apart and then rebuild the laptops the fastest. I won of course. No, no I didn’t but came in a close second. I will be very upset when it ends! Your requests and suggestions for future posts. Give a simple name to the concept or subject you would like to know more about. Tell me a little about why you would like to learn this, or what it would help you do better.